Bitcoin 365 Club was started on 13th of March 2016 and added to AlexNews on 21st of March 2016. This program is mainly based on long term plans and running from 14 days (till 27th March 2016). This program has launched with small advertising activities but I have seen some big investors joined there already. To be honest, it will be too early if we predict the future of this program. But, we can get some idea from their website, investment plans and technical specifications. 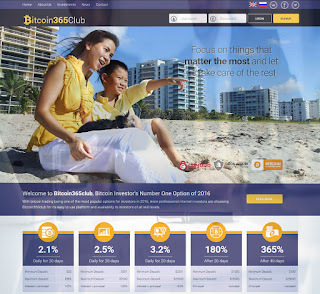 Bitcoin 365 Club has a good looking website but the images used there are not ideal for HYIP sites. At least those are not suitable with the program name. However, other contents are the common tools of Hyip programs. Investment plans are located at the right area but providing an investment calculator could make it more impressive. There are not so many details are provided on the homepage but the necessary and common details are not missed. A video presentation could be more impressive but it could be added on the "Latest News" area later. The "About Us" page has a lot of unique articles and some reasonable pictures are also presented there. A company certificate is also presented there. All other links and pages are working perfectly and F.A.Q page is also modified with some new questions and answers. Unfortunately, there are no live chat support is presented on website also no telephone numbers available. The only way to contact them is the “Support Form”. By the way, they’ve some active social media services. 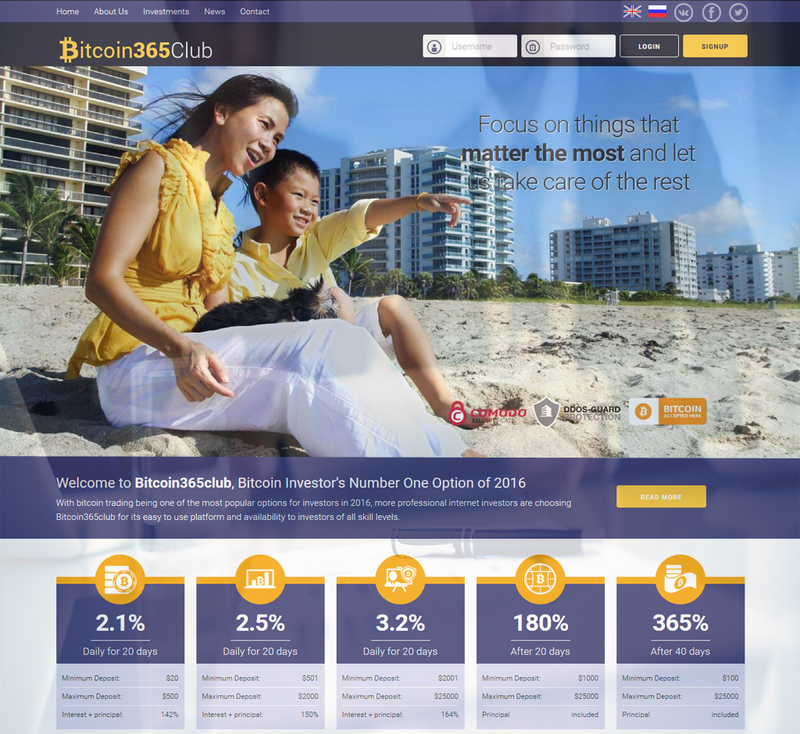 Bitcoin 365 Club is offering three daily paying investment plans and two "After Day" plans. Daily plans are – 2.1%, 2.5% & 3.2% daily for 20 days, principal back at the end of the term. Minimum investment started from $20 and the maximum is $25,000. Thanks to admin that there are no extra calculations of business days and the profit will be paid 7 days per week. From $20 to $500 investments will get 2.1% daily for 20 days and principal will be back at the end of the term. Net profit is 42% and the total profit will be 142% when the principal will be back at the end. From $501 to $2000 investments will get 2.5% daily for 20 days and the total profit will be 150% when the principal will be back. There is also opportunity to earn 3.2% daily but need to invest at least $2001 at that plan. Total outcomes are look very attractive on all plans but the first plan (142% in 20 days) looks most attractive as the minimum investment amount is in reach of general investors. 2nd plan is also in reach of some investors and fortunately the term is same 20 days. After Day plans are – 180% after 20 days and 365% after 40 days. Minimum is started from $100 and the maximum is $25,000. If you don’t need to withdraw profits daily then these “After Day” plans are very attractive but unfortunately the minimum investment is started from $1000 for 180% after 20 days plan which isn’t an ideal amount to invest in an “After Day” plans. You can invest $100 also but have to wait 40 days to get 365% at the end. Unfortunately, none of those “After Day” plans look promising. Bitcoin 365 Club accepts so many payment processors – Perfect Money, Payeer, BitCoin, Neteller, AdvCash & NixMoney. So,peoples from outside of HYIP industry will be able to invest here from their desired payment processors. All deposits are instant and withdrawals will be processed manually in less than 24 hours. The member area of Bitcoin 365 Club looks very nice and professional. The script is based on GoldCoders it’s highly customized for a better design. The website is hosted on a dedicated server of DDoS Guard and DDoS protection is also provided by the same company. Extended Validate SSL is also provided for a secure connection and a better impression. Finally, It’s look like the program is produced by an experienced and professional admin. He has already spent enough for his program and he has some big investors in his hand already. All signs are positive but if you want to invest a big amount here then you need to observe this program for more days. As there is a condition of principal back at the end, we need to confirm that they’ve back principal of some big investors. Or, if you think that joining as earlier in a HYIP is the wise decision then you should invest a small amount here and can increase your deposits when the program get stable. But please don’t invest more than you afford to lose in any stage of any HYIP program. DreamHost is definitely one of the best hosting provider with plans for all of your hosting needs.